Pierantonio Bandini Baroncelli was an Italian Banker who succeeded Tommaso Portinari as manager of the Medici Bank in Bruges. 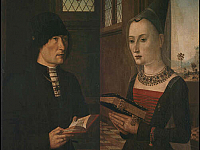 An unknown Netherlandish artist executed a portrait of Baroncelli and his wife, Maria Bonciani, which both hang in the Uffizi Gallery. This has earned the artist the title, Master of the Baroncelli Portraits. His style of painting is close to that of contemporary, Hans Memling (1430 – 1494) or an earlier Bruges painter, Petrus Christus (1410 – 1475).